You are here: Home / Organizing / Organizing Myths: Are they Holding You Back? Organizing Myths: Are they Holding You Back? As I was thinking about all the organizing I would do for the new year, I remembered a document I put together in early 2015 that went only to email subscribers. I think it’s time we set it free for everyone! If you saw the original version, I’d still encourage you to scan through as a refresher. I’ve added some things and there were some reminders I needed on the list. I think you’ll find it helpful as well. Truth #1: It can be as inexpensive or as outrageously expensive as you would like. While it’s fun and helpful to splurge on some specialty products, some of my favorite organized spaces came together using extremely inexpensive materials. In fact, one of my most pinned solutions can be replicated for PENNIES. Do you have any clothespins lying around? What about super glue? 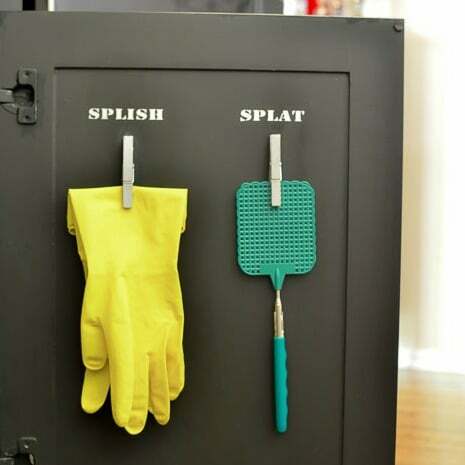 Add them together and attach them to a cabinet door for instant functional storage like I did under my kitchen sink. I use my gloves several times a week when I do dishes and the original clothespin is holding up really well. 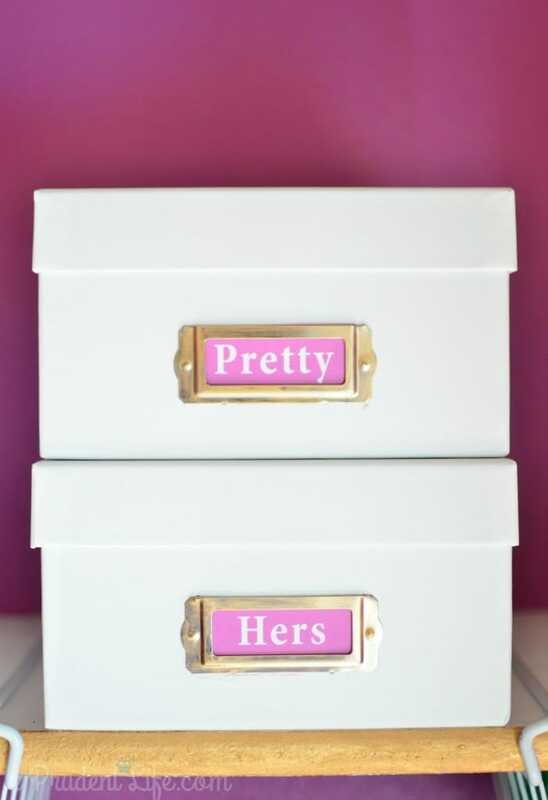 Another one of my favorite organizing items can be found on sale for under $2 each several times a year at Michael’s. I use their photo boxes for pretty much everything except photos. They are perfect for extra toiletries in our bathroom. Or for seasonal cookie cutters at the top of the pantry. And those white & gold bins? They are plastic tubs from Dollar Tree ($1 each!) that I spray painted to match the pantry. While I go super frugal when I can, I have found that being willing to strategically spend a little when I have the budget is well worth it. I’m still not talking thousands, but buying things like the tiered spice rack in the bathroom (Amazon affiliate link) for my hair products has been so helpful. It’s a one-time expense that I get use out of every single day. 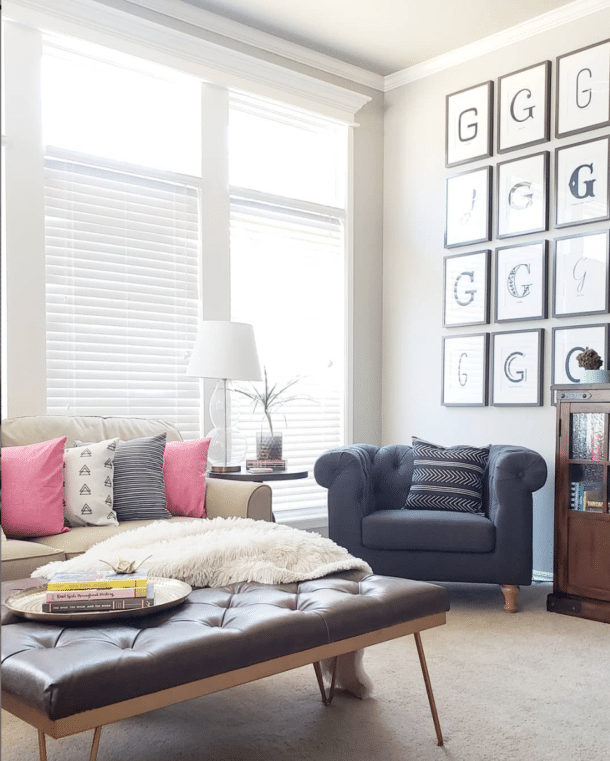 If there is an area of your home that makes you super-crazy, set a little money aside before organizing it. 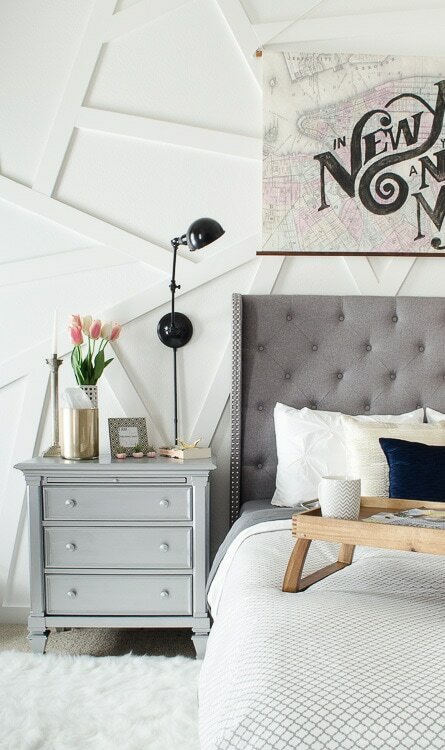 You might be able to conquer it with only super-frugal solutions, but having the freedom to spend a little more in some areas will ensure you end up with the most functional space possible. Truth: Small, fast changes will go a long way and SAVE you time every day. 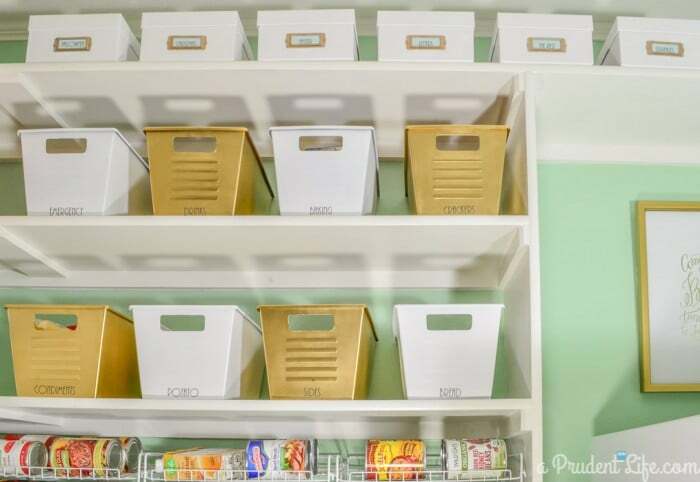 Just like #1 where you COULD spend thousands of dollars, you could spend a TON of time organizing. But the good news is that you don’t have to! The key is tackling small areas each week instead of trying to attack years worth of mess all at one time. Instead of planning to organize your entire closet at once, break it up into sections. Do the shoes one night, then purge dresses in a separate session. 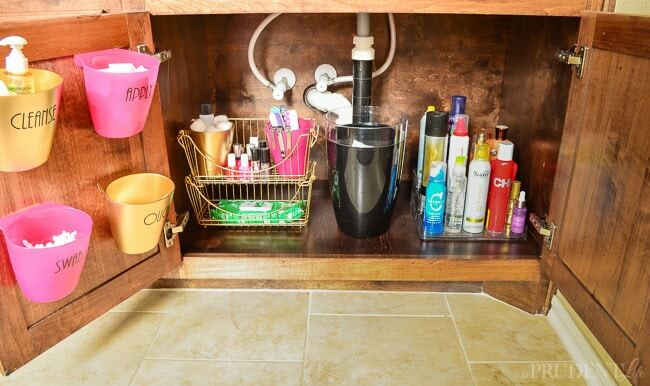 Try to carve out 15 minutes a week to declutter and organize small sections of your home. By the end of the year, you’ll have improved 52 spaces! For a year, I was frustrated with the disorder under my bathroom sink, but I told myself I didn’t have time to fix it. That was just an excuse for laziness! Once I committed to organizing the space, it took less than 30 minutes. Such a waste that I didn’t do it sooner. And yet it still took me another year to tackle my husband’s side of the bathroom because I kept thinking IT would take forever. Sometimes you have to learn by repetition. His side came together just as fast and we spend way less time hunting for things. Some projects can be done in under 5 minutes. 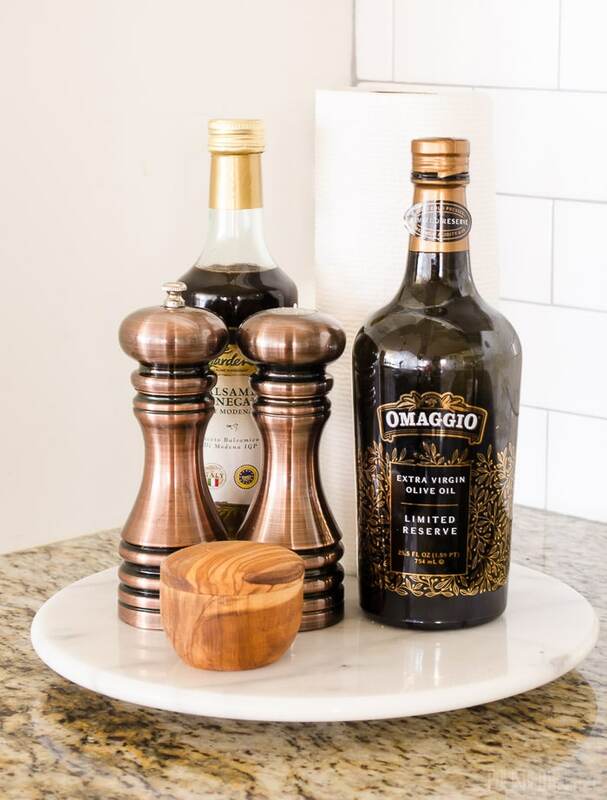 One of the easy swaps we made in the kitchen was adding a small marble tray for the most frequently used items. It’s a tiny change, but SO convenient! Myth #3: Things won’t STAY organized. Truth #3: When organizing is done right, things CAN stay organized. If you simply declutter, it’s likely clutter will come back. 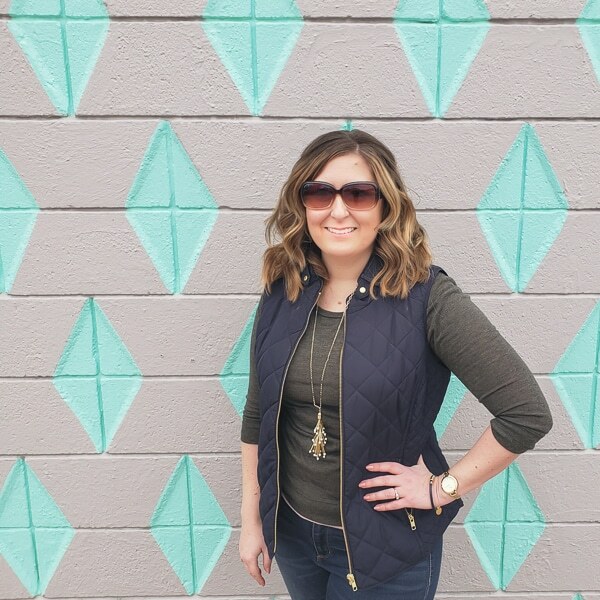 But if you follow along with the guidelines in the 7 Things I Learned About Organizing My Home post, you WILL be able to get and KEEP your home organized. 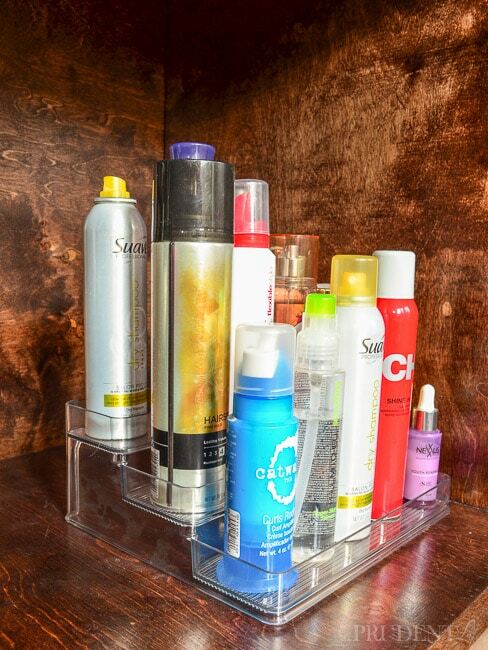 Putting things back in your organized space should be less work than when the space was cluttered and disorganized. I’m not promising magic of course, you have to do basic maintenance. For example, I’ll let some small trash or clutter end up on the pantry counter. It never lasts long though. In a few minutes, I can always have our pantry looking great. I heard this myth so many times after we shared the pantry makeover that I did a 6 month follow-up post responding to some of the critics. I think it’s also important to be realistic. Organized spaces can turn into a mess quickly if you don’t adapt to changes. If I start canning my own vegetables, I can’t assume the same configuration on the pantry shelves will work. I’ll have to adapt and swap things around for that lifestyle change. Myth #4: I’m naturally messy, so I can’t be organized. Truth #4: Sadly, I’m a huge mess. I kick my socks off in bed and let them add up on the floor WAY too many days in a row. For years, my nightstand was consistently covered in water glasses. One came in every night but one did not always go out. Usually 4 or 5 would go out at once, which happened in 2 scenarios. First, sometimes no more cups would fit (and yes, I am horrified I am admitting this). Second, I collected the cups when the dishwasher is almost full and I just needed a few more things to run it. I tell you these things not to embarrass my mother, who IS naturally neat, but to let you know it isn’t hopeless! I figured out the key to a neat and organized house is simply having systems in place that work for you. I’m still a work in progress, but our home is working so much better for us now. I want everyone to have that same experience. We used to have an issue with lint, clothing tags, and other small trash cluttering the laundry room because there wasn’t room for a trash can. As some lovely people on the internet pointed out, it isn’t HARD to walk across the house to throw it away. But that system clearly wasn’t working for us because it wasn’t in the natural flow of doing laundry. 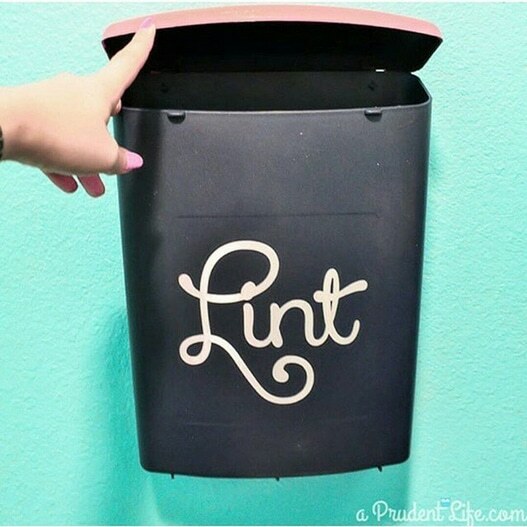 Figuring out I could add a wall-mounted bin for lint and trash was a game changer. No more mess! Decorating also helps me overcome my natural messy tendencies. My nightstand cup-collecting habit was almost 100% fixed when we updated the bedroom. Now the nightstand is decorated and my desire to keep it looking good is a great motivator. Do any of those myths sound like things you’ve been told OR that you have told yourself? I’m going to get super corny for a minute and tell you that BELIEVING your house can be organized and work for your family is the most important step. Yes, some people are born organizers and others have to work for it. But, it’s possible for everyone to start making changes to your home that really will improve your life. Our homes should be our havens – where we escape the other stresses of life. When they are tidy, it’s easier to breath and relax. Perfection every day is NOT possible. Please don’t think I’m writing this from a perfect desk in a perfect home. I’m surrounded by receipts, packing supplies from Etsy orders, and some other miscellaneous stuff. BUT, because I put a system in place a few months ago, I know my desktop can be clear in minutes. Organization is about progressively making your home work better for you. Don’t strive for perfection in the whole house tomorrow. Instead, identify your top struggles, and work through the list one at a time. 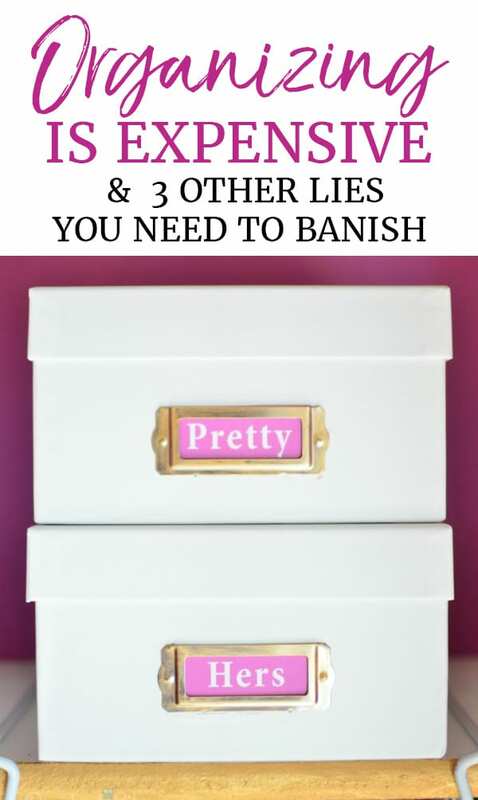 For decluttering tips that really work, head to this article next! Definitely!! I really need to get my under the sink organized! I’m planning too……..eventually. lol. I read the original pdf of this and loved the motivation behind it, glad to read it again with updated info! I have a random quick question, I painted the same Dollar Tree bins for my pantry and when I went to put some vinyl on them with transfer tape and it pulled the spray paint right off with the tape! Any hints or tips for this? I could have had bad transfer tape and my vinyl back then wasn’t good quality but I’m nervous to try again (or at least that’s my excuse for not reorganizing my pantry and labeling it!) Thanks for the awesome posts! I’m so glad you enjoyed seeing it again, Amanda! I had the same thing happen with some bathroom bins I tried to label, which shocked me since the ones in the pantry went on with no issue. My first thought was that I hadn’t let the paint cure as long in the bathroom, so you might try waiting 3-5 days between painting and labeling. I didn’t use a spray sealer/top-coat on mine either time, but after the bathroom fail, I decided I’d try that the next time as well. Even with both of those, sometimes transfer tape just doesn’t like to let go. I’ve heard you can use painters tape instead of transfer tape, and I bet that would be more gentle. I’ve also reused transfer tape before and it releases better after the first transfer. So maybe place your transfer tape on a piece of paper first, pull it up, and then go about the normal transfer process? Sorry I don’t have a more conclusive answer, but hopefully that gets you started! Worse case scenario, I’ve thought about using plain white address labels on bins and then putting the pretty vinyl label on those so I’m putting the vinyl on a more cooperative surface. So that’s another option!